Happy Monday everyone! 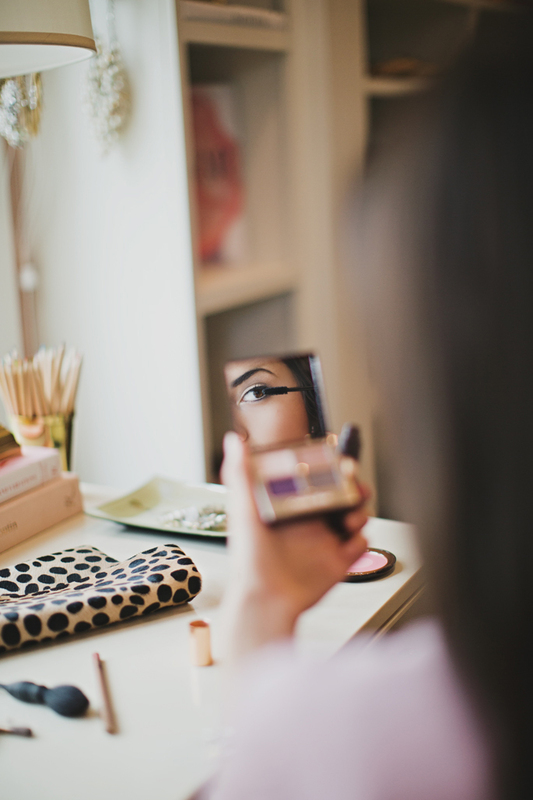 I’ve been a beauty junkie from the time I was in Jr. High, always experimenting with the latest and greatest beauty products. Today, I’m excited to be teaming up with Nordstrom to share with you an all new (incredible) makeup collection they’re carrying in-store and online. I’ve been a fan of Charlotte Tilbury as a makeup artist for years, always looking to her work as inspiration for my own beauty looks. Last year, she launched her own makeup collection that just hit Nordstrom.com a few weeks ago! Currently, my favorite product she offers is the Charlotte’s Magic Cream Moisturizer. 6 months ago, I splurged on a moisturizer that has been amazing for my skin but the Magic Cream Moisturizer has given me the same amazing results and it’s not as expensive! Be sure to check out her amazing collection and let me know which products are your favorite!! lovely pink color! I ‘ll try the brand! you are beautiful! Oh wow!!! What an amazing post with the most nicest photos!? You look stunning! These pics are gorgeous. If you get the chance, join my linkup today to share your amazing post. Wow the makeup collection looks amazing! Can’t wait to get my hands on it. Such lovely shots! 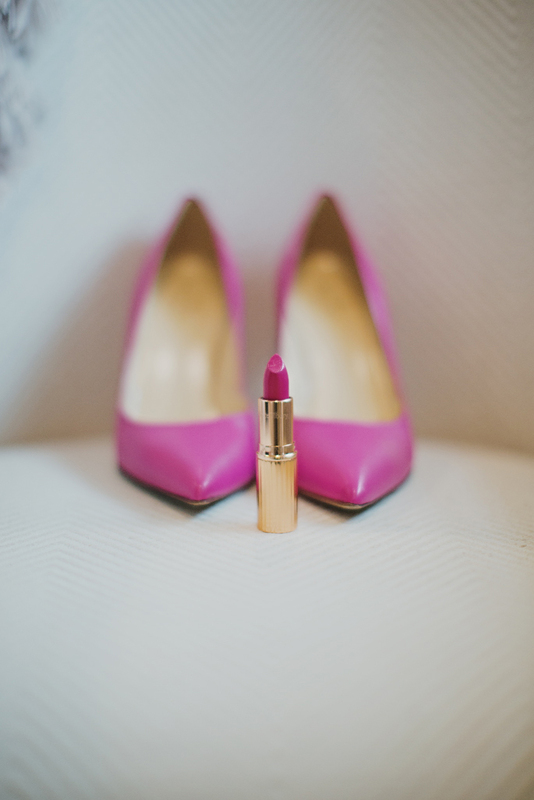 The fuchsia lip color is so pretty and goes perfectly with the pumps! The makeup line seems fab! Your closet/office gets me every time. It is such a beautiful space, I think I would never leave the room! Seems like some great products! Love the lipstick color on you! Absolutely stunning photos! That lipstick is gorgeous and I LOVE your look here!! Wow, your photos look amazing. They could be ad or magazine photos. Gorgeous pictures. Love the shoes. I’m swooning over those Kate Spade heels! You look fabulous, what a great post! That top is so adorable! That fur coat hanging on your chair looks amazing!! I love all your pictures, especially seeing your little pup underneath your desk. Too cute!!! i am still drooling over your closet! lucky girl!!!! Love the lipstick and that leather skirt is stunning. Good to know about the moisturizer! Will have to try! GORG as always! I’m loving that lipstick color!! I’ve been searching for a fun berry color. Love it! Beautiful post Rach! You’ve inspired me to try bright pink lipstick. I’ve always gravitated towards neutrals and, although, a bright lip is out of my comfort zone, I think I’ll give it a try. I’m also interested to try some of these new products. Too bad our Nordstrom here in Orlando closed (insert sad face here). But, since they have free returns it’s not a problem to give it a try without testing in store. these pictures are so beautiful! Love the color of the lipstick and skirt – u look stunning as always! Love these photos! That rug is gorgeous. Hi Rachel! Loved this post and your pictures look beautiful. I haven’t tried this brand yet but I’m excited to now! I am loving that leather skirt on you! Such a pretty lipstick colour! I’ve never tried any Charlotte Tilbury products… I’ll have to check some of these out. Thanks for the tips! Love that skirt. I love playing with new make-up as well. Thanks for your recommendations! I will have to check out this line on my next trip to Nordstrom. Your shoes are so great! I love that color. You are simply gorgeous in this feature – I adore your work space. Wow. I have seen lots of posts on Charlotte Tilbury and think I will have to try some of their products soon! 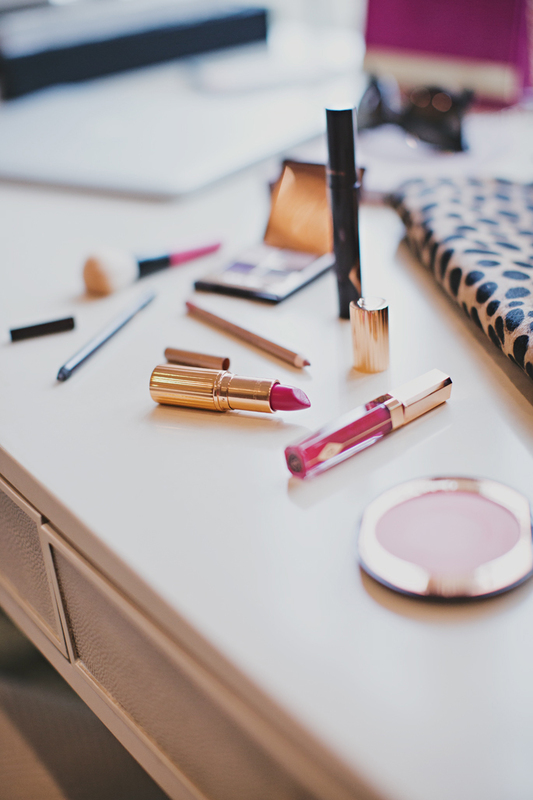 As a makeup fanatic I love this post and definitely need to try some of the products! I really want to try out her moisturizer as well. My mom uses La Mer as well and it works wonders, but is a little too pricy for myself so I cannot wait to try her moisturizer. And lipstick since the color looks gorgeous on you and I really love the packaging! Absolutely beautiful pictures. That lipstick is stunning! I have never heard of this particular brand. I tend to stick to Bobbi Brown. I am going to have to look around Nordstrom to see if mine has them in stock. What an amazing lipstick!! Does it have a matte finish? I’ve been hearing so much about charlotte tilbury lately and I’m so excited to see her products in action! thanks so much for sharing! You look wonderful and I love your leather skirt! These picture are absolutely stunning! Everything looks beautiful Can’t wait to try these new products! Great photos! I love the lipstick! That lipstick color looks gorgeous and I adore the packaging! That is such a pretty lip color! I love it! I recently discovered your blog and am obsessed! I am so happy you did a makeup post as I always love your makeup looks. Will you share what foundation you use? Thanks!! 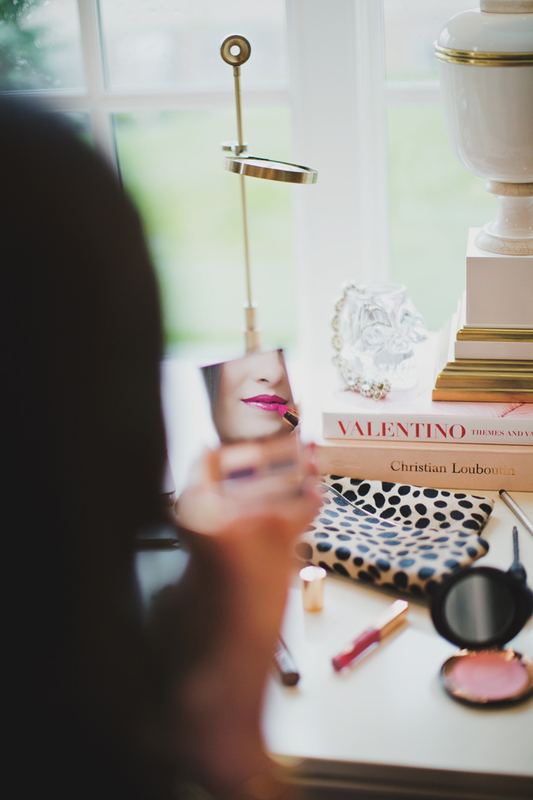 so in love with your workspace! Love the lip color! I will definitely have to try this new make up line! I absolutely love the velvet underground lipstick. I’ll be on the look out for this at Nordstrom! I’m French and i love your blog. This makeup is so chic ! The KISSING lipstick absolute insane! been wearing it for the past week nonstop and so in love- great tip on the moisturizer! Cannot wait to try it. GREAT GREAT pics- Jessa is the best and you look wonderful in your gorgeous closet space. Gorgeous lip color! Also love your Kate Spade heels — so feminine. I’ve been looking for a good moisturizer, especially one to rejuvenate my eyes. Any chance this one helps with that issue? Love the makeup! Absolutely gorgeous! 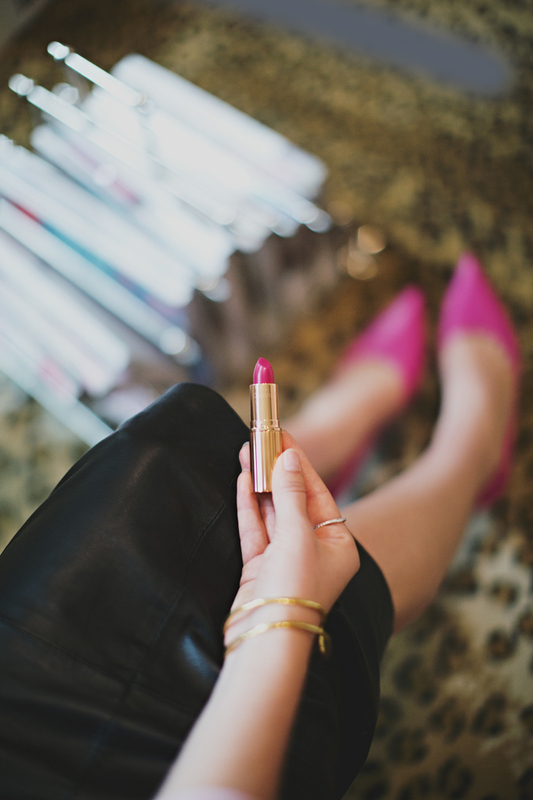 Love your lipstick,have to get! This look is fierce!! I wanted to know where you got the coat on the chair? Do you know if there is something similar to it out there? HI! I am swooning over your closet. Do you mind if I ask the source for the rug you have there?